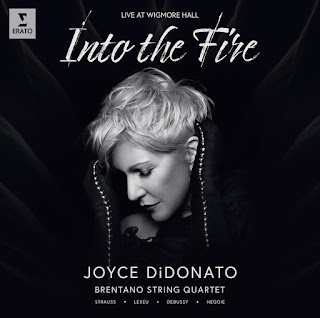 In December of last year, Joyce DiDonato gave two performances at Wigmore Hall in London featuring Jake Heggie’s song cycle Camille Claudel: Into the Fire. 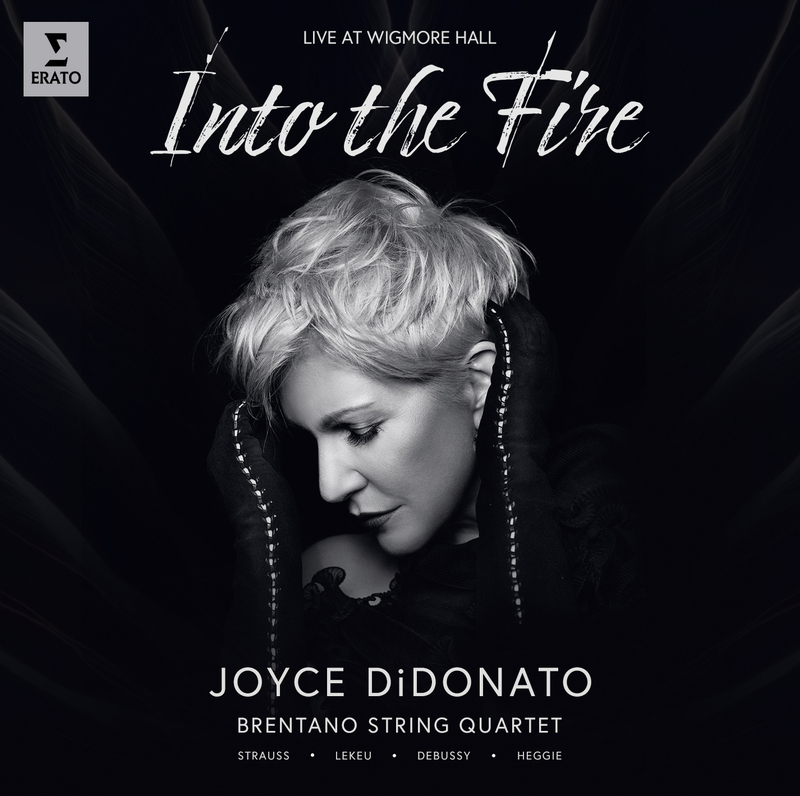 Heggie scored this piece for mezzo and string quartet; so for this performance DiDonato was accompanied by the Brentano String Quartet, consisting of violinists Mark Steinberg and Serena Canin, violist Misha Amory, and cellist Nina Maria Lee. Having committed that ensemble for the concert, DiDonato decided that they would accompany her for the entire program. So they prepared their own arrangements of the piano parts for six songs by Richard Strauss (one of which was an encore selection) and the three songs that Claude Debussy set from the Chansons de Bilitis poems of Pierre Louÿs. The group was also allowed to perform one selection without DiDonato, a quartet movement by Guillaume Lekeu given only an extended tempo marking as a title, “Molto adagio sempre cantante doloroso,” probably chosen for its reflection on singing. The second performance of this program, on December 21, was recorded for subsequent CD distribution by Erato. That performance included a second encore, a Brentano arrangement of Franz Xaver Gruber’s “Silent Night” with a special descant line for DiDonato. The resulting CD is scheduled for release by Warner Classics this Friday. As usual, Amazon.com is processing pre-orders. For those revving up to accuse this project of gimmickry, I have to say that, as far as my own opinions are concerned, Brentano’s approaches to both Strauss and Debussy could not have been better. Remember, Strauss himself reworked many of the songs he wrote for voice and orchestra; so it is hard to imagine Strauss’ spirit being displeased with this undertaking. For that matter, it is reasonable to assume that all of the Brentano players are familiar with the sextet that Strauss wrote to introduce his Capriccio opera, meaning that they were well equipped to do justice to Strauss’ own approach to rhetoric, rather than just the notes. Note to sound greedy, but I could probably do with an entire album of Strauss presented this way by DiDonato and Brentano. The same can be said for their approach to Debussy’s accompaniments, where there is a long-standing tradition of reworking music that Debussy wrote for piano for other resources; and the Lekeu offering is definitely a “hidden gem” that needs to be brought into the light more often. On the other hand I am not quite sure just what Heggie had in mind in his decision to set Gene Scheer’s texts about Camille Claudel with a quartet, rather than a piano, providing accompaniment. Did he think the piano would be too aggressive for Scheer’s words? Listening to this recording, it is hard to tell, since a generous percentage of those words could not be comprehended, even in the more subdued context of a string quartet accompaniment. Given the expressiveness that DiDonato brought to her technique, there are at least suggestions of profundity in the texts, if not in a narrative that spans the entire cycle. Sadly, any rhetorical effect that DiDonato was probably trying to achieve never quite registered in this recorded version. Perhaps, as they like to say, you had to be there.